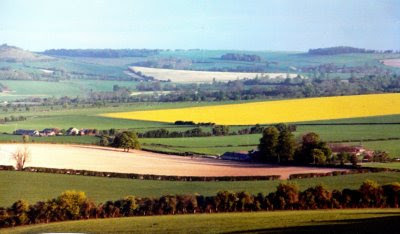 Under Patrick, Stocks (with the addition of Harvestgate) became one of the finest farms in the Meon Valley, regularly winning prizes for its crops. In the early days, sugar beet and potatoes were grown alongside the oats, wheat and barley, and beef cattle were reared and there were sheep on the downs. But as time went on, the farm became essentially purely an arable farm, particularly well known for the quality of its barley. In later years, Patrick took specialist advice on fertilizers and soil quality which improved yields significantly, and when he turned 80 in 1994, turned over much of the day to day management of the farm to his neighbour Stephen Horn, who maintained it to the same high standard - and still does today (2008). 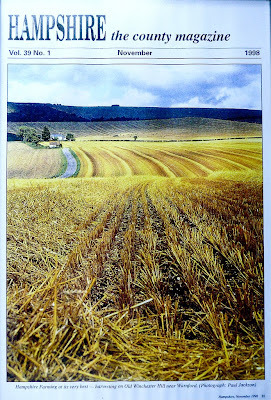 The caption reads: 'Hampshire farming at its very best - harvesting on Old Winchester Hill, Warnford" Hampshire Magazine's photo of Stocks Down and the cottages just after harvest in 1998. Patrick also built Stock and Harvestgate up into an enjoyable shoot, planting cover and copses to add to the woods already there, and rearing pheasants. At one time he employed a part-time gamekeeper so that his friends could enjoy a good day out.